6.5 Grendel is your next alternative for competitive shooting. Most recognizable for its meaningful shape, accuracy, reliability, and easy maintenance, this is the system that will take you between your standard AR-15 build and AR-10. This is a competition rifle. Used mostly for performance and competitive shooting. All you need is a barrel, a BCG and the ammo - and here we go, you have a new, competitive performance rife. At Moriarti Arms you can find all the necessary components to take you standard AR-15 rifle to the next level - 6.5 Grendel all the way! 6.5 Grendel Type II Complete Bolt Carrier Group - .136 face depthCaliber Gauge 6.5 Grendel Type 2Platform AR-15Bolt Finish Manganese PhosphateBolt Material 9310 SteelCarrier Finish Nickel BoronCarrier Material 8620 Carpenter SteelCarrier Style M16 Bolt CarrierHigh Pressure Tested MP..
6.5 GRENDEL TYPE II STRIPPED BOLT - .136 face depth9310 STEEL Material6.5 Grendel Type II CaliberParkerized FinishMPI TestedPlease read on differences between 6.5 Grendel Type 1 and 6.5 Grendel Type II..
AR-15 14.5" sabre defence 6.5 grendel type II cl barrel 1-7.5 twist pinned flash hider. 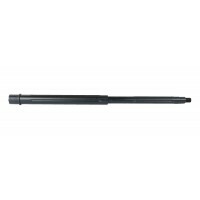 9/16-24 standard threaded muzzle end to accept muzzle brakes/compensators. 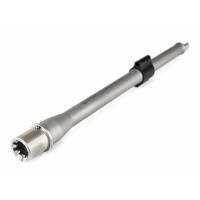 THIS ITEM COMES WITH A PINNED WELDED A2 FLASH HIDER MADE FROM 4150 CMV STEEL HARDENED TO 26-32 RC AND STRESS RELIEVED. 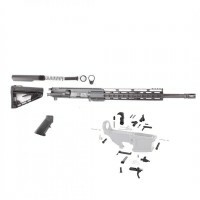 CHRO..
Moriarti Armament's AR-15/M-16 16″ Parkerized 6.5 Grendel Type II FULLY ASSEMBLED COMPLETE Upper Assembly Package includes:AR15 / M16 Enhanced Upper Receiver 16″ Contour Parkerized 6.5 Grendel (Type II) 4150 Chrome Moly Steel Barrel with 1:8 Twist and Carbine Gas.750 Low Pro..
AR-15 6.5 GRENDEL 12" PREMIUM PISTOL UPPER W/ SUPER SLIM RAILEvery Upper Build is Test Fired Before Shipment To Guarantee Performance. We do not guarantee cycling with all ammunition due to vast differences in the quality of ammunition. 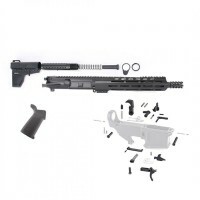 We will not warranty cycling with imported, steel cased or relo..
AR-15 6.5 Grendel 16" Complete Upper Receiver w/ ATLAS S-ONE Handguard This drop-in 6.5 Grendel Type 2 upper will attach to virtually any standard AR-15 lower assembly. 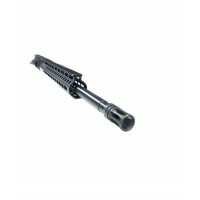 Upgrade the performance of your AR-15 build with this 6.5 Grendel Complete Upper Receiver. 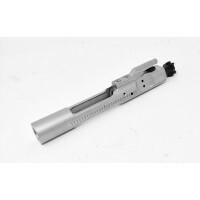 Designed to be a low recoil/hi..
AR-15 6.5 Grendel 18" stainless steel competition upper assembly, This drop-in 6.5 Grendel Type 2 upper will attach to virtually any standard AR-15 lower assembly. 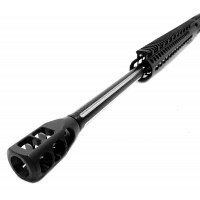 Available in 416R Stainless Steel threaded barrels with 1 and 8" twist and mid length slim keymod fre..
AR-15 6.5 Grendel 18" nitride upper assembly with slim keymod rail, This drop-in 6.5 Grendel Type 2 upper will attach to virtually any standard AR-15 lower assembly. 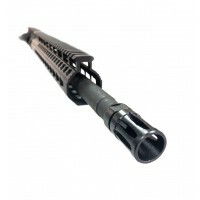 Available in 4150 Steel Black Nitride Finish, with 1 and 8" twist and mid length slim keymod free float handguards..
AR-15 6.5 Grendel 22" Black Diamond Competition Bull Upper Assembly. You inquired and we listened. 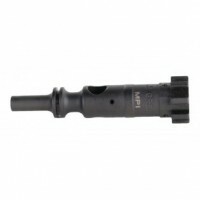 For a limited time, black diamond fluted Grendel uppers are put together just for you. This drop-in upper will attach to virtually any standard Mil Spec AR-15 lower assembly. 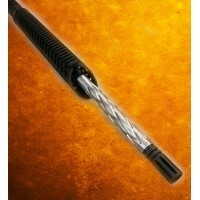 Works best with your ..
AR-15 6.5 Grendel 22" stainless steel barrel. 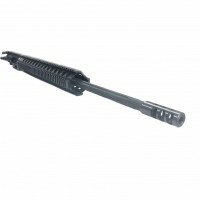 This a great addition for your drop-in 6.5 Grendel upper. 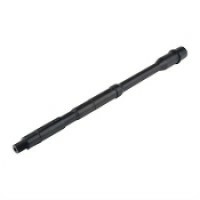 Available in 416R Stainless Steel threaded Black Shark fluted bull barrels. 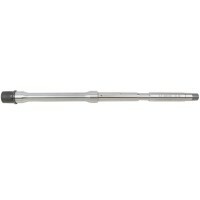 Features: 22" 416 stainless steel fluted bull barrel. Hardened to 26-32 rc a..
AR-15 6.5 Grendel 22" Black Wolf Competition Bull Upper AssemblyThis drop-in upper will attach to virtually any standard Mil Spec AR-15 lower assembly. Works best with your standard 5.56 Mags. 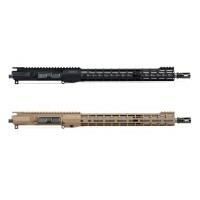 Moriarti's exclusive 416R Stainless Steel nitride coated straight fluted double tone Black Wolf b..
AR-15 6.5 Grendel 22" stainless steel competition bull upper assembly. This drop-in upper will attach to virtually any standard AR-15 lower assembly. Available in 416R Stainless Steel threaded fluted bull barrels, with 1 and 8.5" twist and rifle key..
AR-15 6.5 Grendel 22" Nitride Diamond Competition Bull Upper Assembly. 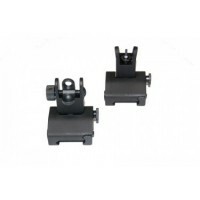 This drop-in upper will attach to virtually any standard Mil Spec AR-15 lower assembly. Works best with your standard 5.56 Mags. 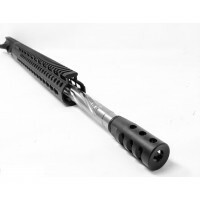 Available in 416R Stainless Steel nitride coated diamond flute threaded bull ba..
AR-15 6.5 22" Grendel Side Charger stainless steel competition upper assembly - side charger. This drop-in upper will attach to virtually any standard AR-15 lower assembly. 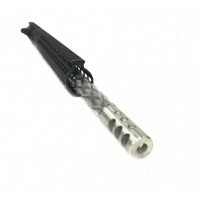 Available in 416R Stainless Steel threaded barrels, with 1 and 8.5" twist and rifle length keymod.. This is a true 6.5 Grendel Type 2 competition upper assembly. All you need is a 6.5 BCG and some ammo to convert your AR-15 into the most desirable 6.5 Grendel. Works best with standard 5.56 magazines. California and NY compliant. 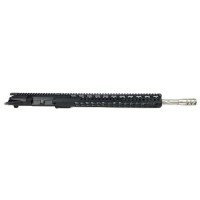 AR-15 6.5 Grendel 24" competition upper assembly includes:Barrel..
AR-15 6.5 Grendel 24" stainless fluted upper assembly complete with BCG and CH . California and NY compliant. 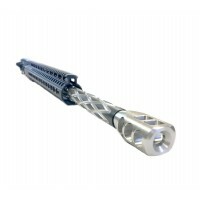 AR-15 6.5 Grendel 24" stainless steel upper assembly includes:Barrel - 24" stainless fluted 416R heavy barrel. Hardened to 26-32 rc and stress relieved. 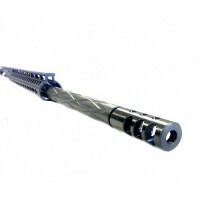 Chambered in 6.5 Grend..
AR-15 6.5 Grendel II 12.5" BA Ballistic Advantage Barrel, Premium Series - This 6.5 Grendel "Type 2" chambered 12.5" inch barrel is machined from 416R Stainless Steel with a bead blasted finish. 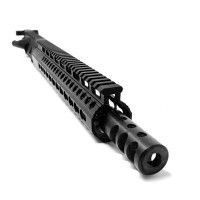 ThisPremium Series Barrels features a FailZero Nickel Boron Coated Extended M4 Feed Ramp Extension.1..
AR-15 6.5 Grendel II 16" Barrel, 1x8 Twist, Stainless Steel6.5 Grendel Type II416 R Stainless SteelM4 FeedRamps1x8Contour profile5/8x24 ThreadCarbine Gas System.750 gas block diameter ..
AR-15 6.5 Grendel II 18" Barrel, 1x8 Twist, Nitride18" length6.5 Grendel Type II4150 Steel, Black Nitride FinishM4 FeedRamps1x8Heavy hbar profile5/8x24 ThreadMidlength Gas System.750 gas block diameter ..
AR-15 6.5 Grendel II 18" HEAVY BARREL, 1:8 5R TWIST, STAINLESS STEEL, FLUTED18" Length6.5 Grendel Type II416 R Stainless SteelM4 FeedRamps1x8.5Heavy profile5/8x24 ThreadMidlength Gas System.750 gas block diameter ..